For questions about the DNP programs or applying to the DNP programs, call the Office of Student Affairs at MU School of Nursing at 573.882.0277 or 800.437.4339, or email Leslie McPeak at mcpeakl@missouri.edu. Application for the DNP Program will be considered as they are received. Applications must be received by April 1 to be considered for summer semester start. We recommend applying early as applications are considered as they are received. See Interview by Invitation below for more information on the the rolling admission process. All students begin coursework the summer following program acceptance and are required to attend the N7087 Leadership and Technology Institute On-Campus days. Applicants who do not meet the minimum GPA requirements for their BSN or MS also may provide additional evidence documenting examples of outstanding professional leadership, practice and/or scholarship for special consideration. Completion of a graduate course in introductory statistics or biostatistics within the last 5 years is required prior to entry or may be taken concurrently with N7087 the first semester of program enrollment. Up to 38 graduate credits of required coursework can be accepted in transfer with the approval of the program director. 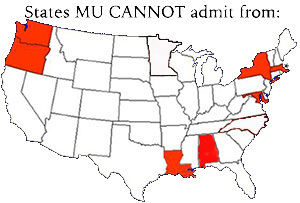 *At this time, the University of Missouri can accept students from Maryland ONLY for the Family Nurse Practitioner Area of Study. Submission of a 3-5 page essay describing your professional goals in addition to a selected practice-based problem of interest that will serve as the basis for your, scholarly DNP project. The scope of the project should be large enough that it would result in, for example, a change at the organizational, system, regional or national level; new or revised state health policy; or the establishment of a significant new health-related service to a population or geographic region. The purpose of the essay is to provide the Admission Committee insight into the professional goals and expectations of the applicant, congruency of topic area with faculty expertise and an opportunity to evaluate the applicant’s written communication skills. Copies of all advanced practice nursing certification and/or credentialing/recognition documents for applicants with a master’s degree as applicable. Completion of the clinical hour verification form for applicants with clinical hours from previous MS and/or certificate programs. Curriculum vitae using the official MU Sinclair School of Nursing template. Professional Recommendations: Submission of three (3) professional recommendations supporting the applicant’s potential success in the DNP program. Applicants currently enrolled in a nursing program must submit at least one (1) recommendation from a current faculty member in that program. Recommendations from family, friends, fellow staff nurses, or minister will not be accepted. The Graduate Studies Application Fee and your MU Sinclair School of Nursing Application Fee is required for all new DNP applicants, both U.S. citizens and permanent residents. The application fee is nonrefundable; it is not applicable to the educational fee, student activities fee, computing fee or student health fee; and it is valid for one academic year (three semesters). Once you have completed your online application, the fee must be submitted online before your application can be processed. Documentation of English-Language Proficiency is required for Non-native English speaking applicants. Applicants must submit documentation of English-language proficiency, demonstrated through a satisfactory Test of English as a Foreign Language (TOEFL) or International English Language Testing System (IELTS) score within the last two years. Please upload TOEFL &/or IELTS scores in the online Graduate Studies application to expedite application review. See the Office of Research and Graduate Studies page on English Proficiency. Once application materials have been processed through the online application system and after a preliminary review of academic credentials and applications materials, an interview will be arranged. The interview process will take place within weeks of the completed application being received. Student interviews may take place in person or via electronic means for distance students. Applicants will receive notification of their acceptance decision within two weeks.